What is Glyphosate and Why Should I Care? According to Wikipedia, Roundup is the brand name of a systemic, broad-specturm glyposate-based herbicide. Roundup is used most heavily on corn, soy, and cotton crops that have been genetically modified to withstand the chemical, but since 2012 glyphosate was used in California to treat other crops like almond, peach, cantaloupe, onion, cherry, sweet corn, and citrus. Although the main active ingredient of Roundup is the isopropylamine salt of glyphosate, it also contains a surfactant. According to Sustainable Pulse in the article “A Short History of Glyphosate” (2017) Glyphosate was patented in 1961 for use as a descaling (for cleaning pipes) and chelating agent. In 1970 it was again patented, but this time as an herbicide by Monsanto scientist John Franz. By 1974 it had been given the trade name Roundup and was on the market. Within 11 years of being on the market, the EPA had classified glyphosate as a class C carcinogen meaning that it has “suggestive evidence of carcinogenic potential”. By 1991, Monsanto had succeeded in reclassifying the herbicide glyphosate from class C “suggestive evidence of carcinogenic potential” to class E which suggests “evidence of non-carcinogenicity for humans”. The first roundup ready soybeans were introduced in 1996 and by 2010, Monsanto had also patented glyphosate as an antibiotic. In 2012, almost 30 years after the first patent, studies are beginning to emerge that show harm being caused by low doses of glyphosate-based herbicides and GM crops. Rats fed on a diet containing roundup tolerant maize or water containing roundup at levels permitted in drinking water and gm crops in the US suffered severe liver and kidney damage. There were other independent studies emerging showing possible damage to health by this herbicide. The WHO classified glyphosate as “probably carcinogenic to humans” in 2015. Shortly after this, the University of California at San Francisco discovers glyphosate in 93% of urine samples collected across the U. S. and by 2016 it is being found in many popular American foods. Not too long after that a study was published showing that roundup causes liver disease at low doses. Rats who were given extremely low doses of roundup over a two year period developed non-alcoholic fatty liver disease. Although this study was performed on rats and not humans, the results are disturbing because the amount of roundup given was thousands of times below what is permitted by regulators worldwide. More recently, Monsanto was ordered to pay over 289 million dollars in total damages (reduced to 78 million) to a former school groundskeeper who developed non-Hodgkin’s lymphoma caused by Roundup. Around the world, 28 countries have restricted or banned the use of this herbicide. This list includes France, Italy, Sweden, Germany India, Scotland, UK, Spain, NZ, and Greece. Many cities and counties in the US have banned or restricted its use. However, Austin is the only city in the whole state of Texas with restrictions on use. The city council has voted to prohibit its use on city lands. Roundup is used on wheat crops also, not just the “roundup ready” wheat during time of growth, but it is also used to hasten the crop to harvest especially in years where it is slow to mature and get to harvest stage when the farmers are ready to collect the wheat and bring it to market. This is referred to as “desiccating the crop”. Tom Ehrhardt, co-owner of Minnesota-based Albert Lea Seeds, says that sourcing grains not desiccated with glyphosate prior to harvest is a challenge. “I have talked with millers of conventionally produced grain and they all agree it's very difficult to source oats, wheat, flax and triticale, which have not been sprayed with glyphosate prior to harvest," he said. “It's a 'don't ask, don't tell policy' in the industry." Dr. Stephanie Seneff has published many scientific articles on the herbicide glyphosate. In the article, “Glyphosate pathways to modern diseases VI: Prions, amyloidoses and autoimmune neurological diseases”, Stephanie Seneff and Anthony Samsel describe the way that glyphosate can interfere with human health. They say that the usage of the herbicide glyphosate on core crops in the USA has increased exponentially over the past two decades and corresponds to the exponential increase in autoimmune diseases. Seneff and Samsel conclude that widespread misincorporation of glyphosate for glycine during protein synthesis could explain the aetiology of multiple autoimmune diseases that are currently increasing in incidence in the USA. They believe that proteins from foods such as milk, wheat and sugar beet, as well as peptides derived from microbes resident in the gut or nasal tract or introduced iatrogenically through vaccination, are all potential causes of autoimmune disease induced through molecular mimicry. They show how substitution of glyphosate for glycine during protein synthesis could yield a peptide that is more likely to induce an immune response. In this paper they also show how enzymes involved in proteolysis are likely to be disrupted due to their confirmed contamination with glyphosate. A list of possible diseases that can be attributed to this mechanism include autism, multiple sclerosis, type 1 diabetes, coeliac disease, inflamatory bowel disease and neuromyelitis optica. “...it [glyphosate] has a direct link to high cholesterol.” She says that glyphosate interferes with the liver’s ability to make cholesterol sulfate and that this causes the liver to send cholesterol out into the body as LDL particles because it cannot distribute the cholesterol as cholesterol sulfate. Glyphosate is present in many popular vaccines including the measles, mumps and rubella (MMR) vaccine and this has been verified by Seneff and Samsel. These are just a couple of ways that glyphosate disrupts metabolic pathways in animals and how exposure can happen. If you accept these theories, then the next step is to begin to wonder how this affects you and your loved ones. You might start by asking yourself asking what can be done to protect me and my family from glyphosate exposure? According to Dr. Seneff, other Doctors and healthcare experts, the best way to avoid glyphosate is to eat organic as much as possible. Avoid the products made with GMO or Roundup Ready crops such as Milk, Refined Sugar (made from Beets), Wheat, Corn and Soy. Avoid products made from animals fed GMO or Roundup Ready crops. You can also add supplements to your diet that help to repair the damage done by glyphosates. Do not eat baked goods, tortillas or chips, cereals, corn, beer, sugar, chickpeas, lentils, or soybeans. Do not eat milk or dairy products or meat from animals fed on GMO or roundup ready crops. Do not eat cooking oils or margarine especially no canola oil, corn oil, soy oil or safflower oil. Do eat plenty of good quality cholesterol, get lots of sunshine and plenty of sleep. Do eat sulfur rich foods such as garlic, onions, and organic eggs. Take probiotics, manganese bisglycinate, dandelion, barberry, burdock, bone broth from grassfed cows, organic collagen, proteolytic enzymes, as well as fulvic and humic acid mineral supplements. Do supplement with organic msm, b-complex that includes choline, activated charcoal, calcium bentonite clay, sauerkraut juice, glutathione, and vit c.
Do not use roundup on your own lawn, and limit your children and pet’s exposure to outdoor spaces where you suspect it is being used. Health care experts such as Dr. Seneff conclude that glyphosate contamination is pervasive. So we are all exposed to some amount of it no matter how careful we are. But if we are diligent about eating organic you will greatly reduce our exposure to this chemical we can thereby reduce our chance of having health problems resulting from its influence on us. I am now offering consultations at Nature's Presence on Main Street in Boerne on Fridays and some Mondays. If you haven't been in the store in a while, check it out. They have an excellent selection of supplements, Chinese herbal formulas, homeopathic remedies, personal care items, alternative cleaning supplies, some bulk herbs, CBD products, and essential oils. We have begun offering short seminars during the week. I'll be talking along with others this Wednesday, February 20th starting at 12:00 noon. I'm also giving a seminar to explain and talk about Chinese Medicine on Friday, March 1st at noon. Why is is so important for us to eat organic foods? 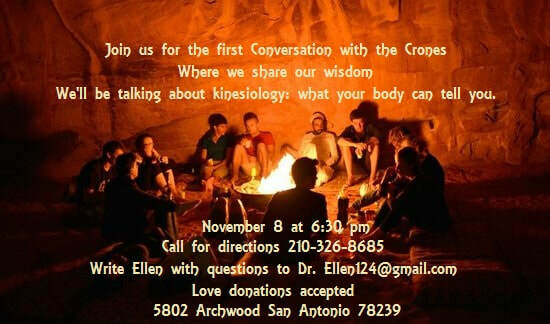 Starting this month I will be available for consultations at Nature's Presence in Boerne. You can find me in the store on Friday, January 25th, Monday January 28th, Friday February 8th, every other Friday after that and most Mondays. Nature's Presence now carries Chinese Herbal Formulas and I will be available to help you find the best fit for your unique condition. All Consultations are completely confidential. Sign up with a member of the staff, or call me at 512-940-8843. As some of you already know, my life has been in flux lately. I am now settled in Boerne, Texas for a while. If you would like to see me, please call, text or email (512-940-9943, dr2bwell@gmail.com) and I'll let you know my availability. I am still in my office in Blanco, the same place that I've been for the last 10 years. The phone # for sceduling appointments is 830-833-0510. I'm starting a new Qi Gong class. Please email or text me at (512-940-8843, or dr2bwell@gmail.com) for location and dates. There will be a new class on acupressure for body workers beginning soon. This is suitable for anyone who wants an in depth look at how to use acupressure to treat specific problems. I'll go into the basics of traditional Chinese Medicine, a little bit of diagnosis, and we will learn a few points and techniques. This class is full of information, we will work on each other in order to gain experience, and you will learn enough to be able to add acupressure to your bodywork practice. This is level one of a series of classes designed to help anyone understand Chinese Medicine enough to help themselves feel better and more confident when going to a practitioner for acupuncture treatment. The United States loses approximately one hundred lives a day as a consequence of the current opioid epidemic--addiction and abuse of prescription painkillers like Oxycontin and Vicodin. If projections prove correct, another half a million more casualties may be on the way over the next ten years. Opioid overdose now ranks as the number one killer for Americans younger than 50 years old. Opioids are a class of powerful drugs used primarily as a treatment for pain and provide relief in the most excruciating of cases. Morphine, codeine, heroine, fentanyl, oxycodone (Oxycontin, Percocet) and hydrocodone (Vicodin) are all classified as opioids. Unfortunately, the risk of addiction with these drugs is high because opioids are so effective and can give users a feeling of euphoria. Short term use of these drugs is the safest option as it lowers the chances of developing a drug tolerance. Developing a tolerance means a patient must take higher and higher doses of the drug to experience the same euphoric effects. This deadly cycle of increasing drug amounts can destroy lives and lead to a potentially deadly overdose. In cases where an opioid addict undergoes detoxification, withdrawal symptoms often make the process a terribly difficult experience. Signs and symptoms associated with withdrawal from opioids include: pain, intense emotional anguish, diarrhea, nausea, vomiting, hypertension, tachycardia and seizures. Treatment options for rehabilitation generally include a gradual reduction from the drug. Special drugs such as methadone and buprenorphine can help assuage withdrawal symptoms and reduce cravings. These drugs do not produce euphoric effects and have a lower risk of addiction. Acupuncture and Oriental Medicine treats opioid addiction in a holistic fashion. Not only is the physical body addressed, but the heart and mind as well. The heart represents the emotions, and the mind refers to the logical, cognitive functions. A great start to assisting patients during the rehabilitation process is the utilization of a simple and effective ear acupuncture protocol. The treatment consists of ten acupuncture needles applied to five points on each ear. After needle insertion, all a patient needs to do is sit quietly in a cozy chair for at least 20 minutes, up to one hour. The selection of ear points includes lung, shen men, autonomic point, liver and kidney. The lung point helps maintain an even, steady breathing pattern. This helps keep emotions such as grief and sadness from becoming an overwhelming burden. Additionally, it supports the respiratory and cardiovascular system. It is particularly useful for addictions related to smoking. Shen men addresses the stress, anxiety, anguish and depression associated with opioid withdrawal. It also reduces the physical pain which may occur during the process. The autonomic point works on the nervous system by balancing the parasympathetic and sympathetic system. The former calms bodily functions, while the latter speeds things up. The liver point aids the liver organ in cleansing the blood and removing toxic material. The kidney point is similar in function, as the kidney also plays a major role in ridding the body of harmful substances. A key difference between the points is the emotions they treat. The liver point works to reduce anger and frustration, while the kidney point helps to alleviate fear. Some patients may require additional acupuncture points. For example, a person manifesting signs and feelings of rage could benefit with the addition of an ear point called limbic system. It reduces aggressive, compulsive behavior which may lead to violence. This particular auricular therapy is known as the NADA protocol. Developed in the 1970’s due to the efforts of Dr. Michael Smith at the Lincoln Memorial Hospital in New York, NADA stands for the National Acupuncture Detoxification Association. Dr. Smith created the NADA protocol as a treatment to help many suffering with heroin addiction in the local community. The success of the NADA program helped recovering addicts lower their chances of recidivism and increase their chances of entering society as healthy, drug-free individuals. In 1996, the World Health Organization declared acupuncture as a viable method to assist patients in withdrawing from chemical dependencies. Three reasons why acupuncture receives such high accolades for its success in treating opioid addictions, and other substances as well, is due to its simplicity, cost-effectiveness and absence of negative side effects. It is also safe for patients of virtually any age group, and in most cases, for pregnant women. Sometimes it is not only the patients who need treatment, but family members and loved ones who also suffer as their loved ones go through the withdrawal process. Application of the NADA protocol is safe for them and may help in dealing with their heavy emotions. It is support for the support team, so to speak. With an estimated 2.5 million people dealing with opioid addiction, safe and effective methods are needed more than ever to curb this national public health crisis. Whether the addiction is from doctor prescribed opiates, or illegal street drugs like heroine, acupuncture and Oriental medicine provides treatment. ​Fall is a time of Thankfulness. A time to begin slowing down our energies. Collecting and assessing what has been created throughout the spring and summer seasons. ​Although we often become more frantic as the season wears on, this frantic-ness goes against the natural rhythm of nature that is telling us to slow down and prepare to hunker down in a warm and cozy place for a bit. ​This frantic-ness is born of fear. The fear of not having enough. In modern times, this manifests in not having enough Christmas presents and Christmas cheer, Christmas money, and Christmas decorations and so forth. In times past, it might have been fear of not having enough provisions for the winter season. ​Winter is a time of reflection. A time to be still and listen to those tiny voices that get lost in the busy-ness of rushing around to get things done. These are some of the questions I ponder when the stillness takes me into its bosom. In the stillness I often find the answers that I seek. ​In Chinese Medicine, winter is related to the Lungs and Large Intestines. The associated emotion is grief or sadness. Grief has to do with letting go of (or not being able to let go of) people, situations, or things that we love. ​ Inner reflection can bring awareness to suppressed or hidden grief. This brings us the opportunity to release this grief. Tapping is one way to do this. The stronger your emotions while doing this, the more effective will be the release of emotions from tapping. ​Winter can be a time of re-evaluation; a time to re-evaluate the past, to re-evaluate the future… or it could be a time for simply being in the present. ​The transition time between seasons is where we shift gears. It can be a challenge to let go of all the busy-ness, to sit still and become at peace with winter, to discover the inner self. ​Personally, I have to make an effort to deliberately change my pace, especially if those around me remain in the crazy-mode. I set aside time to bring my consciousness down a notch or two at a time. Even if it is only for a few minutes. A few minutes of sitting, just being, breathing in and breathing out. Those few minutes each day gradually reduce the crazy and I find myself taking deeper breaths. I find myself thinking, feeling, and sitting still without forcing it. Brings peace into my heart. Tinctures and Salves made with care from all natural ingredients using knowledge and experience gained from my education in Chinese Herbal Medicine as well as my many years of doctoring my own family with herbs and home made medicines. I'm proud to soon be able to offer a few special tinctures and salves for sale on this site. Conversation with the Crones Second gathering is yet to be announced.